Students are given the instruction, support and quality materials they need to build a high-quality western saddle that will last a lifetime with proper care. From start to finish students are guided through all the steps necessary to produce a saddle they can be proud of…just take a look! “I made it back to Mongolia, and the saddle arrived fine as well! The bubble wrap and bag, and some extra padding did the trick. I arrived back here just in time for the New Year celebrations, so had to eat mutton and drink vodka. I showed my Mongolian friends pictures of the saddle and the work and they are very impressed and interested. 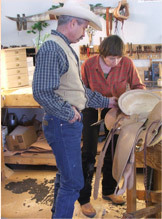 The hands-on course at Sierra Saddlery School truly provides “Learning by Doing” instruction and excellent opportunity to practice skills and get acquainted with tools, equipment and materials needed for saddle making. 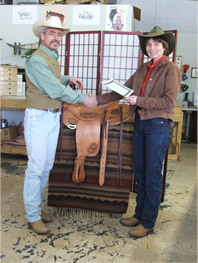 I could only do a 5-week course for now, but even as a novice to saddle making, I feel confident that I am equipped with the basic skills and knowledge, and information on sourcing materials and equipment, that I can begin with my own work. I came to your saddle shop looking to learn how to construct a leather purse. You said that if instead of a purse I learned how to build a saddle, I would be able to apply the knowledge gained to any future leather project. You were right! You taught me the basics and beyond the basics of how to work with leather and the tools needed to do so. You opened my eyes and helped me reach beyond my comfort zone. Your teaching methods, your honesty and your constant positive feedback are what helped me build the beautiful saddle I took with me at the end of the 5-week course. Being a student under your tutelage has been one of the best experiences in my life, and I do not say this lightly. I am looking for the opportunity to return and build my #2 saddle. Maybe this time around, I’ll also learn how to ride a horse! 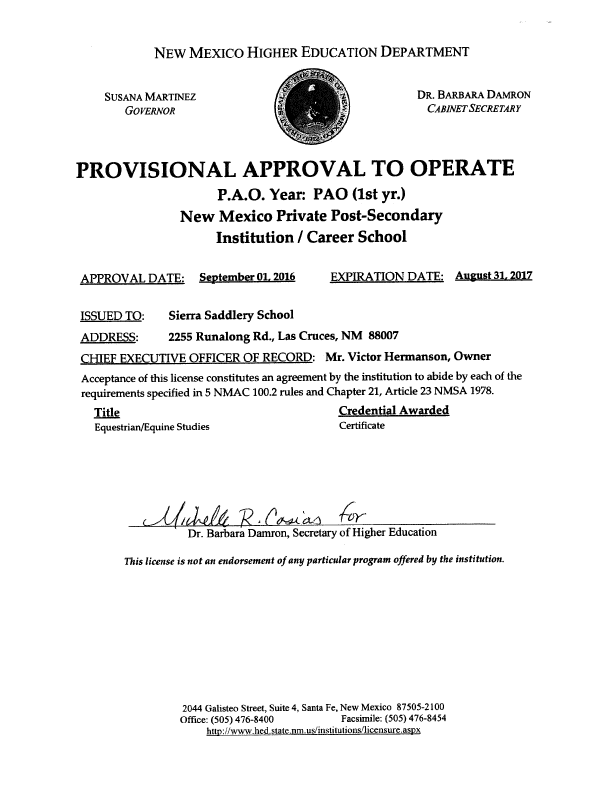 “I attended Sierra Saddle School in 1999. It was the best thing I have ever done for myself. Victor Hermanson was an excellent instructor. Before I started school, I had no idea what was even under the seat when you raised the seat jockey. Victor made everything simple so that even someone who knew nothing about saddles other than how to put them on the horse and ride, could build a comfortable, beautiful saddle that would last lifetime. He kept me at a slow steady pace until I was totally comfortable with all the tools and how to work the leather instead of letting it work me. After I completed the school, I went to work immediately for an old saddlemaker in the local area until I could get all my own tools and equipment together to open my own shop. I ran my own shop until Hurricane Katrina. I had some damage and shut it down for a while. Another saddlemaker heard about me shutting down my shop and immediately contacted me and made me an offer and I have been working for him since that time. We probably build between 60 to 75 custom saddles every year. Once I finished school, there hasn’t been a day that I’ve been out of work. Victor and I always keep in touch and anytime we come across new ideas or new ways to make our jobs easier, we share it. I can call anytime with a problem and we can figure out a solution on how to work it out. I would highly recommend Victor Hermanson and his school to anyone.